Install, inspect, test, and maintain wet chemical extinguishing systems correctly using new NFPA 17A. The 2017 edition of NFPA 17A: Standard for Wet Chemical Extinguishing Systems outlines the latest rules for wet chemical extinguishing systems associated with restaurant and institutional hoods, plenums, ducts, and associated cooking appliances. 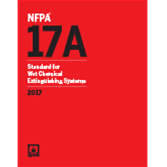 Interested in other editions of NFPA 17A? Use the drop down menu above to select the edition year you need. 4.5 Pipe and Fittings, Tubing, Hose. 4.7 Electrical Wiring and Equipment. Install, inspect, test, and maintain wet chemical extinguishing systems correctly using the 2013 NFPA 17A. Newly updated, the 2013 NFPA 17A: Standard for Wet Chemical Extinguishing Systems outlines the latest rules for wet chemical extinguishing systems associated with restaurant and institutional hoods, plenums, ducts, and associated cooking appliances.